A new pot that is slightly larger and deeper. Don’t go too large—an extra 1–2 inches in diameter is plenty for a small plant, while 2–4 inches will do for a larger plant. Water your plant at least a day before you remove it from its current pot. This keeps the root ball (basically, the mass of roots and soil) from disintegrating. You may also moisten the new potting mix if it’s really dry. Add a base layer of potting mix to the new container. If it has drainage holes, place it in a tray or put a coffee filter in the bottom first to prevent soil from falling out. Your base layer should be thick enough so that when you place the plant inside, it doesn’t come higher than the top of the pot. Don’t just yank your plant out by its stem. You can turn the pot sideways and tap the sides and bottom of the container or turn it upside down and gently rotate the plant until it slides out. Loosen the root ball with your fingers (but don’t shred it to pieces), and cut away any extra-long roots that are growing outside of the ball. Place your plant on top of the fresh soil and fill in the empty space around it so it stays upright. You don’t have to fill it all the way to the top or pack the soil down. Leave some space (about an inch for larger containers) between the soil and the top of the pot. 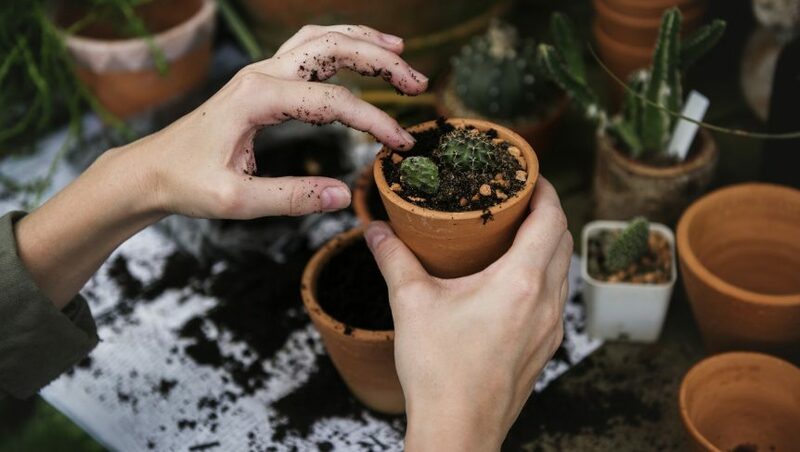 Repotting can be stressful for plants, so water your plant well and keep it out of direct sunlight for a few days.